Low birth weight (LBW)/prematurity have been proposed as risk factors for the development of kidney disease in adulthood. Whether there is an association between LBW/prematurity and poor renal outcomes in childhood onset nephrotic syndrome remains unknown. 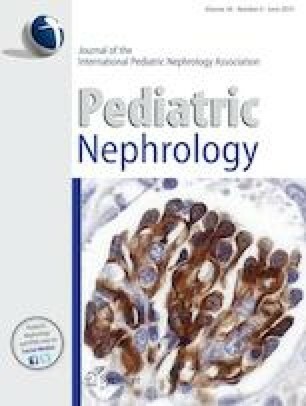 Children with nephrotic syndrome diagnosed between 1 and 18 years of age were followed prospectively from 1996 to 2016 at The Hospital for Sick Children (N = 377). LBW/prematurity was defined as birth weight < 2500 g or gestational age < 36 weeks. Normal birth weight (NBW) was defined as birth weight ≥ 2500 g. Measures evaluating clinical course of nephrotic syndrome include initial steroid-resistant nephrotic syndrome (SRNS), time to first relapse, and frequently relapsing nephrotic syndrome. Kaplan-Meier survival analysis, logistic regression, and Cox proportional hazards regression were used to determine the association of LBW/prematurity with clinical outcomes. Median birth weights in LBW/premature (n = 46) and NBW (n = 331) children were 2098 g (interquartile range [IQR] 1700–2325 g) and 3317 g (IQR 2977–3685 g), respectively. Odds of having SRNS were 3.78 (95% confidence interval [CI] 1.28–11.21) times higher among LBW/premature children than NBW children. An 8% decrease in odds of developing SRNS was observed for every 100 g increase in birth weight (adjusted odds ratio [OR] 0.92; 95% CI 0.86–0.98). Median time to first relapse did not differ (hazard ratio [HR] 0.89; 95% CI 0.53–1.16). LBW/premature children were more likely to develop SRNS but did not have a difference in time to first relapse with NBW children. Understanding the impact and mechanism of birth weight and steroid-resistant disease needs further study. We thank the participants and their families for their time and effort, as well as the nurses and staff from the Nephrology Clinic at the Hospital for Sick Children and William Osler Health System—Brampton Civic Hospital and Peel Memorial Centre. We also thank Richard Child for his advice and insight into the electronic patient record. Research idea and study design: RP; CPBL DN, DH; SR; RJP; and VL; data acquisition: VP, TB, NHS, JVR, and KB; manuscript drafting: NK; statistical analysis: NK and TB; figure preparation: NK and TB; supervision: RP. Each author contributed important intellectual content during manuscript revision and accepts accountability for the overall work by ensuring that questions pertaining to the accuracy and integrity of any portion of the work are appropriately investigated and resolved. This study was funded by the Hospital for Sick Children Research Institute and Physicians’ Services Incorporated.